Democrats have a lot of energy this year. But in Mass., where do they put it? The party’s two candidates for governor — Patrick administration budget chief Jay Gonzalez and environmental activist Robert K. Massie — have an army of supporters ready to battle for a party endorsement on Saturday. Thousands of Massachusetts political activists, bolstered by an influx of newcomers, will converge this weekend for the state Democratic convention in Worcester, full of passion and ready to strike a blow at President Trump and Republicans in general. But the some 6,200 party delegates are also facing the political reality that there are limited prospects for directing that energy. 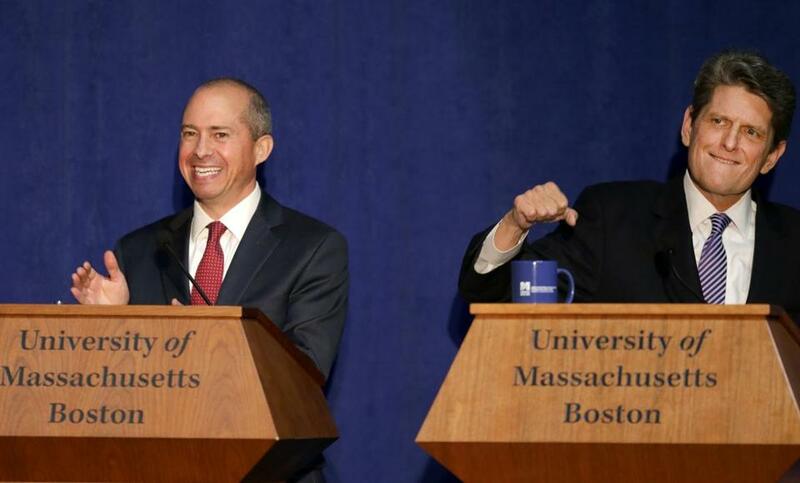 The party’s two candidates for governor —Deval L. Patrick administration budget chief Jay Gonzalez and environmental activist Robert K. Massie — have an army of supporters ready to battle for a party endorsement on Saturday. But the two Democrats have yet to create the sort of preconvention sizzle generated in the past by figures such as Michael Dukakis and Patrick. And the one candidate who has shown she can tap into that anti-Trump passion, US Senator Elizabeth Warren, is considered nearly a shoo-in for a second six-year term. She delivers roof-raising speeches, but her strong poll standings could dampen any urgency for the rank-and-file to hit the streets on her behalf. Warren has no primary opponent, and even the Republican Party’s most savvy insiders quietly concede the senator, with a bulging campaign account, is almost impossible to beat in such a deeply blue state as Massachusetts. Instead, the state Democratic Party’s vice-chair, Debra Kozikowski, acknowledges that this year’s convention will be more of a learning experience for delegates, especially newcomers, who have shown up to work out their anti-Trump exasperations. More than one-fifth of the delegates are first-time convention-goers — a surge not seen in years, according to veteran party leaders. The convention, Kozikowski said, will give them a chance to experience a statewide party event without the brawls of past conventions that could sour newcomers to Massachusetts’ bare-knuckled politics. While the convention may be relatively low-key, compared to prior confabs, the anticipated attacks on Warren by national Republicans this fall could inflame the Democratic base. Democratic analyst Mary Anne Marsh said Republican-backed groups are poised to pour millions of dollars of out-of-state funds into Massachusetts in an effort to leave Warren politically wounded for a potential 2020 presidential run. “For Democrats, they want to make sure [Warren] comes out of the election as strong as she can,” Marsh said. Stephanie Martins — chair of the Everett chapter of the recently organized grass-roots progressive group, Our Revolution, and a first-time attendee of a party endorsement convention — acknowledged the race for the governor is not exciting a wide swath of the grass roots. She said the strong odds against defeating a very popular Governor Charlie Baker make it difficult, particularly with underfunded candidates who have yet to catch the public’s attention. She added that much of the energy among her Everett colleagues is aimed at a local legislative race and the congressional race in which US Representative Michael Capuano is facing his first serious challenge in 20 years, from Boston City Councilor Ayanna Pressley. Neither Democrat is on the speaking schedule this weekend. In the gubernatorial primary, Gonzalez, who cites his State House experience and his work in health care, is challenging the more left-leaning Massie for a good chunk of the party’s progressive wing. Massie has staked out strong ground with his impassioned appeal to the activists who comprise Bernie Sanders’s political organization — enough so that he could make a serious run at Gonzalez in the delegate count. Both candidates are expected to surpass the 15 percent delegate threshold to make the Sept. 4 primary ballot. But Gonzalez and Massie are facing serious financial shortages and are hugely out-matched by Baker’s $8 million campaign account. The most exciting race could be for a low-profile but hugely important seat. Josh Zakim, the Boston city councilor challenging Secretary of State William F. Galvin, is running on a message of bringing a fresh perspective to an office that oversees the state’s elections, enforces securities law, and monitors a host of other government functions. Galvin, currently Beacon Hill’s longest-serving elected statewide official, has maintained deep roots in the party. He’s also been among the State House’s more vocal opponents of Trump, rapping the president publicly on his misplaced voter fraud claims and other fronts that have inflamed progressive voters. But what he faces — and what observers say Zakim can potentially embody — is a generational wave hungry for new leadership. Galvin, buoyed by his history with the party, is a favorite to win the party’s endorsement. But even a strong showing by Zakim would be a blow, and a victory could be a serious setback for Galvin’s reelection prospects. “For a guy like Josh, it’s not just that he’s young and a newer candidate. It’s also that he is focusing on issues that these voters that are now engaging really care about: access to voting, same-day registration,” said Doug Rubin, a longtime Democratic strategist. Two Democrats are also vying for the endorsement for the obscure lieutenant governor seat. Quentin Palfrey, a former science and technology adviser to the Obama White House, has cornered several party establishment endorsements in his race against comedian Jimmy Tingle, a fellow first-time candidate. The convention is scheduled to open Friday night at Worcester’s DCU Center, with Warren headlining a slate of speeches from candidates not facing a primary challenge, including Attorney General Maura T. Healey, Treasurer Deborah B. Goldberg, and Auditor Suzanne M. Bump. Saturday will include addresses by the candidates running for governor, lieutenant governor, and secretary of state.